It rained all last night, and this morning it was still raining. Our first stop was the ruins of Drukgyel Dzong. 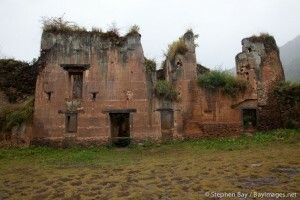 The rain was fairly light so we were able to walk around the ruins. The dzong was built in 1649, but destroyed by fire in 1951. They plan to renovate it, but that would require major funding, so there is no schedule for doing so yet. Personally, I think the ruins are beautiful as is. The site is slowly being taken over by plant life. At one time, it was a massive structure, and now it serves as a reminder of the impermanence of human beings. Whatever we create, nature will eventually reclaim. If it weren’t for the rain, I could have wandered around there all day. Next, we went to Kyichu Lhakhang, which is one of the oldest temples in Bhutan. It is believed to have been built in 659, as part of a series of 108 temples built to pin down a demoness. This is one of two such temples in Bhutan. The remainder are in Tibet. There was a ceremony going on today, and we were able to receive a blessing. On the way to lunch, we stopped at a new hotel for a tour. I admit that I was initially lukewarm about visiting a hotel we weren’t going to stay at, but Zhiwa Ling was definitely worth a visit. I will write more about it in a separate post. The rain started falling harder, and we headed to lunch. I rarely seem to catch the name of the restaurants that we eat at, but this one was pretty good. They served rice noodles with vegetables. They put chili sauce on it, but it was so tasty, I had to eat it. Next, we visited the National Museum. I hate to say that this was the most disappointing site we visited on the trip. They have a wonderful collection, but it is poorly lighted and the signage isn’t always as detailed as I would like. There are also many opportunities to bump your head on low beams. 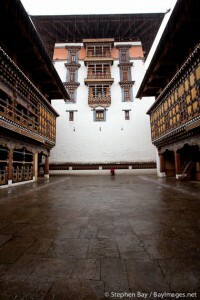 Although I think it is important to keep the traditional Bhutanese architecture there, I think the collection could be displayed to much greater advantage. 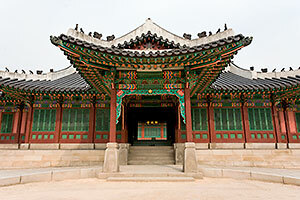 My absolute favorite museum in the world is the National Museum of Korea. I’d love to see Bhutan do something similarly spectacular with their collection. My guess is that they likely have a huge number of artifacts that they do not have the room to display. Our last stop of the day was the Paro Dzong. Because the rain was coming down much harder, we kind of had to edge around the courtyards so we were under the overhangs, since we weren’t allowed to open our umbrellas inside. We went into the monks’ prayer hall where they were memorizing their chants. They weren’t in sync, so it produced this otherworldly sound. I would love to have a recording of that – it was such a beautiful, relaxing sound. 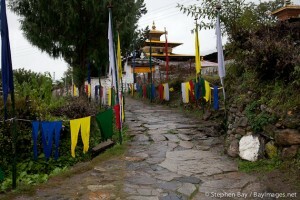 It was only about 3:00 pm when we left the dzong, but we decided against any shopping this afternoon. I just wanted to check into our hotel and try to warm up and take off my wet clothes. We are staying at the Tandiling Resort, which is a fairly new hotel. For the first time in Bhutan, we have a king bed in our room, so we finally get to sleep in the same bed. The room is very nice, if a bit chillier than expected due to the pouring rain. Our concern is that we may not get to experience what should have been the highlight of our trip – the hike to Taktsang Monastery (the Tiger’s Nest). If it is still pouring rain tomorrow, chances are we won’t be able to do it because of all the sliding mud. 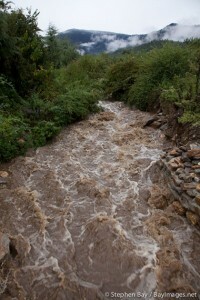 We also heard that the Druk Air planes were unable to take off or land today due to the rain. I sure hope that the day after tomorrow will be nice again so that we can get to Bangkok. We are staying overnight in Bangkok, because the flight from Paro would arrive too late to make the flight to Narita in Tokyo. I don’t know how accommodating United will be if we can’t make our flights. Most airlines, including United, are not known for trying to make things easier for their customers. We used air miles, so we are even lower on United’s compassion list. After dinner, we found out that Pema and Ugyen had gotten stuck down the road, which had flooded, so they couldn’t make it to us for dinner. They stayed in town.